Set for alpha release in the coming weeks, Aurous is aiming to bring Popcorn Time simplicity and presentation to music content discoverable on BitTorrent networks. Taking a decentralized approach which will enable the app to continue functioning even if its website is closed down, Aurous' will turn users into P2P search engines. Over the past 18 months and despite the growing availability of services such as Netflix, Popcorn Time has grown from a little known open source project to a worldwide phenomenon. Operating on the BitTorrent network, Popcorn Time appears to have hit the sweet spot intersecting presentation, ease of use and video content availability. If developer Andrew Sampson has his way, new project ‘Aurous’ will be reaching similar dizzy heights in the music sector. As the brains behind BitTorrent DHT search engine ‘Strike’, Sampson will already be known to readers. The dev says that with Aurous he’s now taking that project in new directions. “Since Strike was created I’ve been very proud of the technology I made, however I’ve been thinking of better, decentralized ways to use it,” Sampson informs TF. While also a media player supporting a wide array of audio formats, Sampson says that Aurous will leverage content on the BitTorrent network to bring a Spotify-like experience to users. “What sets Aurous apart is its ability to allow users to search for music, all over the BitTorrent network, using the very same technology that powers Strike Search,” Sampson says. Sampson says that what Aurous does is turn each client into its own P2P search engine, one that’s able to spot fakes and offer speedy results by weeding out non-audio files. For those interested in how Aurous functions using BitTorrent, a detailed overview is available here. In addition to pulling content from torrents, Aurous is also capable of obtaining content via HTTP, a feature that should expand its library massively. “I’ve also built the ability to search millions of indexed web pages across the internet to find an even larger collection of songs, so if you can’t find some obscure FLAC album on DHT/BitTorrent, then you may find it on some page we have indexed from 2006,” Sampson notes. TorrentFreak was given access to an early pre-alpha build of Aurous and as the screenshot above shows, it’s certainly quite pretty. Searching for content is a breeze and in our limited tests results appeared and played quickly. Sampson says that the pre-alpha build of Aurous searches for torrents on its own network and serves back individual files, but due to a limitation on the number of peers on the network, results are limited. “This network is still small and growing, rest assured come alpha you will be able to locate any song you can think of,” the dev adds. 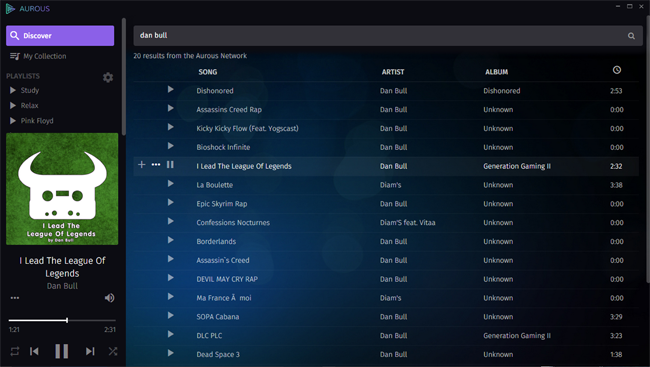 Other features set to debut include playlist importing from the likes of Spotify, YouTube, Google Music and Pandora. Sampson says features for buying content from third-party sources will also make an appearance. “I believe Aurous can be a big game changer. We believe piracy is an access issue, not a money issue, it’s why we will support artists by linking to iTunes/Amazon/Google Music on songs so that Aurous users can easily buy them to show support, but use our client to continue enjoying their tunes,” he explains. Aurous will be available on Windows, Mac, Linux, Android and IOS devices, with support for connected TV coming down the line. It will be free to use and the devs say it won’t have any bundled adware. “In terms of financial support Aurous will be completely free. From time to time you may see a banner based ad or sponsored content, however none of these will interrupt your streams/music playback nor will you ever hear an audio advertisement. Of course we will provide people with other options to get rid of ads entirely,” Sampson concludes. Sampson says that Aurous should be available for public alpha on October 10th which means the team has a month to polish the current press build for public consumption. Whether it will prove to be a Popcorn Time-like success story will remain to be seen but its creators are certainly hoping for something big. Interestingly enough, if Aurous does indeed to shake up the market it will need to provide a better level of service and music discovery features than the free tier of Spotify. While that won’t be easy, Sampson seems to think the challenge is within reach. More details on Aurous can be found here.